Demaryius Thomas‘ stint in Houston lasted just seven games. 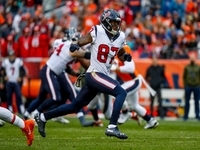 NFL Network’s James Palmer reported Tuesday that the Texans are expected to release the receiver today, per a source informed of the situation. Palmer notes that it remains too early for a timetable on the receiver’s recovery, but Thomas has bounced back quickly in the past. The wideout tore his right Achilles after his rookie season and returned just six months later. Cutting Thomas saves the Texans the entire $14 million on the salary cap in 2019. The non-guaranteed contract was one reason the Broncos were willing to shop Thomas during the trade deadline — they too would have likely cut him had a trade not gone through. For Houston, a fourth-round pick for seven games and 39.2 yards per tilt seems like a lot. At the time of the swap, however, the Texans needed aid for their division title push, so it’s hard to hammer the logic. It wouldn’t be out of the question that Houston could try to re-sign Thomas on a cheaper deal later. First, however, the receiver must get healthy.